Today's wars have no definitive end in sight, are conducted among civilian populations, and are fought not only by soldiers but also by unmanned aerial vehicles. According to M.
Unfortunately, due to sales rights restrictions, we cannot offer Killing Without Heart for sale in your country. Today's wars have no definitive end in sight, are conducted among civilian populations, and are fought not only by soldiers but also by unmanned aerial vehicles. According to M. Shane Riza, this persistent conflict among the people and the trend toward robotic warfare has outpaced deliberate thought and debate about the deep moral issues affecting the military mission and the warrior spirit. The pace of change, Riza explains, is revolutionizing warfare in ways seldom discussed but vitally important. A key development is risk inversion, which occurs when all noncombatants are at greater risk than combatants from technologically superior forces. For the first time, warriors are not the ones shouldering the dangers and horrors of battle. Riza argues that how we win actually matters as much as winning itself. Traditional warfare involves human fallibility; there are ethics in striving that give meaning to war on a personal level. According to Just War theory, this sense of purpose in war imposes a practical limit on what belligerents can and should do to their opponents. Contemporary robotic warfare, however, removes the moral equivalence of combatants and fails to create an end state of mutual respect upon which people can build a lasting peace. 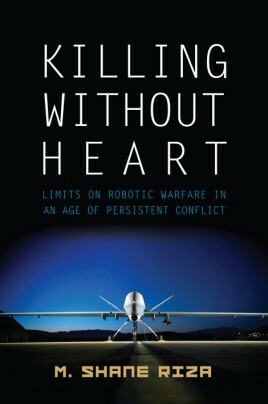 Killing without Heart postulates that if war's ultimate goal is to achieve a lasting peace, fighting today's technological wars of combatant impunity may ultimately render unmanned weapons useless when we realize that robotic weaponry undermines our strategic objectives. M. SHANE RIZA is a command pilot and a graduate of and former instructor at the United States Air Force Weapons School. A veteran of Operations Southern and Northern Watch, he commanded a fighter squadron during Operation Iraqi Freedom. He holds three master's degrees, the most recent in national resource strategy from the National Defense University. He is a resident of Dallas, Texas, and has a home in the North Georgia mountains.